Google closed a lot of services this year, but there are still a few projects that weren't successful enough and have to be discontinued. Probably the last batch of services that bite the dust includes: Google Bookmarks Lists, Google Friend Connect, Google Gears, Google Wave and Knol. Google also removed the timeline search option, which created "a graph of historical results for a query". Google Friend Connect will be replaced by Google+ pages. It will still be available until March 1, 2012 for non-Blogger sites, while the Blogger feature will continue to work for a few more months. Google Wave will become read-only on January 31 and it will be closed 3 months later. The Gears-based offline mode will no longer work in Google Calendar and Gmail starting from next month, so if you're still using an old version of Firefox or Internet Explorer for this feature, you'll have to switch to Chrome. Bookmarks Lists will continue to work until December 19, but I'm sure that not many people will miss it. Knol is a project that attracted experts who wrote a lot of interesting articles, but it wasn't successful enough to make a difference. After all, Knol was a niche service and Google's goal is to "focus on products that can benefit the most people and solve the most important problems". Google informs that "Knol will work as usual until April 30, 2012, and you can download your knols to a file and/or migrate them to WordPress.com. From May 1 through October 1, 2012, knols will no longer be viewable, but can be downloaded and exported. After that time, Knol content will no longer be accessible." Why not preserve the content? Some Google Answers pages are still useful after so many years. It's interesting that all these projects, except for the Gears plugin and the timeline option, had a social component. Now that Google+ is Google's social hub, it makes sense to replace these projects with Google+ features. It would be a shame to lose the various user-provided content. Perhaps wikipedia or archive.org could be interested in taking the knol content? Good for you, Google. You need to kill all of your side-projects and just focus on the big boys, like Gmail, Search, Google+, etc. They have their hands in too many places. I wonder how long it will be until Orkut goes bye-bye? What's a good replacement for Google Bookmark Lists? I use them off my iGoogle page so I have all my bookmarks at home or work. Oh, wait, you're talking about Bookmark Lists, not Google Bookmarks themselves. Never mind. In one stroke you've pissed off a lot of people. Getting rid of many services that you offered over the years means that anything google does might disappear in the future. As a big gfc user, I started using google plus, but why bother? Google plus will probably disappear in a year or two. Why is Google not merging (or transferring) all the data of the services that will disappear into still existing services, e.g. knol into google docs (or something like this), gfc into googlepages or google+ itself? bookmarks into reader or sparks, ... wave can possibly be merged with google+ or a kind of googlegroups or something like that? Buzz could be merged with google+, I suppose? You can export the data, but I'd prefer transferring to existing services. Exporting data is only usefull when you can use the data outside Google without the need of extra software for be able to read the exported files. But what about Wave's scrollbars?! They never open-sourced them! I need to use those things every now and then! To keep my sanity! I was thinking the same, it should not be hard, especially with the money Google founders sends to Wiipedia to sort out a migration path to other services, especially services which are so useful to Google directly. The loss of Google bookmarks might be the straw that breaks my back. I do not use Google+, Chrome is too unflexable fir real use, Gmail works but like others I wonder how much longer it is before they kill that too. I have always liked Google but lately they have been doing nothing but kill services that we use and depend on and have not brought anything back to the table. Google+, oh boy what a pointless service. Google Bookmarks will still be available. The lists feature will be removed. What about Blogger? Will it proceed? I am on wordpress and my Google Friend Connect stopped working about a week ago. So saying it will work until March is bunch of crap. No wonder they have discontinued them I've only heard of half of them. I became very sad that Google friend connect for blogger is closing. It should not be closed and I love that feature. I will miss that so much. From this list, I am particularly sad about Google Gears. Why did they discontinue it before having a viable alternative. The offline Gmail is still in its infancy and the progress seems incredibly slow. Timelines was a frantically useful feature! Anyone know of any search engine that has that? Next most useful would be to rank results in reverse chronological order (oldest first) - anyone doing that? I think it is awesome they are focusing on Google+ and bringing all the services together to make one big, useful experience. Are Google in financial trouble? Since Knols are written by volunteers, I wouldn't have thought Knol cost much to keep going. How much do Google save by ditching it? A few $K per year? Probably less than they spend on corporate hospitality. 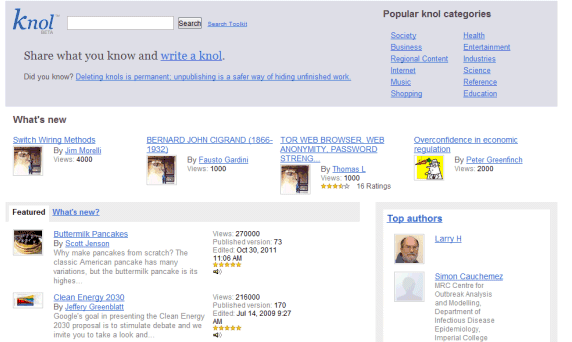 What annoys me is that by taking the Knols away, Google are contributing to link-rot. I still remember an article that Jakob Nielsen wrote in 1998: "Fighting Linkrot", http://www.useit.com/alertbox/980614.html . In it, he says: "Any URL that has ever been exposed to the Internet should live forever: never let any URL die since doing so means that other sites that link to you will experience linkrot. If these sites are conscientious, they will eventually update the link, but not all sites do so. Thus, many potential new users will be met by an error message the first time they visit your site instead of getting the valuable content they were expecting. Remember, people follow links because they want something on your site: the best possible introduction and more valuable than any advertising for attracting new customers." If I've linked to a Knol as a resource for my readers, I don't want Google to kill it and force me to find a replacement. You'd think, with all that they say about how important a good user interface is, that they'd realise this. But perhaps they're so short of money now that they can't afford to care. Excuse me, what?? Will all my followers disappear? I wish Google was more transparent about these changes.